THE MONKEY KING | Love Productions Inc. Journey to the West is one of the four great classical novels of Chinese literature. It was written by Wu Cheng’en and published in the 1590s during the Ming Dynasty. Monkey King Fights the White Bone Demon is one of its famous chapters. It intertwines Chinese fables, fairy tales, legends, superstitions, popular beliefs, monster stories as well as Confucianism, Taoism, and Buddhism. 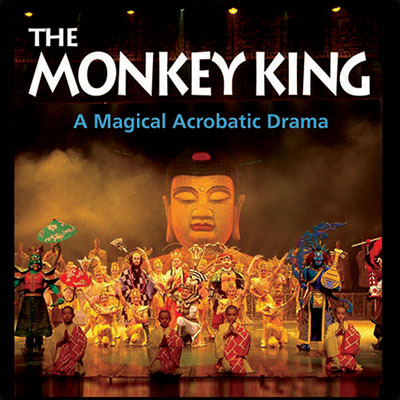 The Monkey King is a cirque production that tells the story of the Monkey, his teacher, and his Buddhist brothers fighting the White Bone Demon as he goes West to seek eternal life. It combines extreme acrobatics, magic and folkloric dances and skills that promise lots of surprises. It is the perfect family show. The show is produced by the Zhejiang Province Folk Art and Acrobatics General Troupe. More than 200 sets of costumes and 1,000 stage props have been designed by the creators of the splendid attires of the Chinese epic films “Hero” and “The Promise”, and the Hollywood adventure film “The Mummy 3.” Director Ding Wei says that for years he had dreamed of turning this classic tale into a cirque stage play.